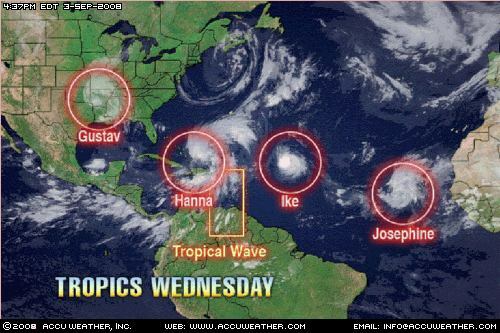 Three named storms are churning in the Atlantic. Tropical Storm Hanna has been hanging around the Bahamas and the Turks and Caicos. 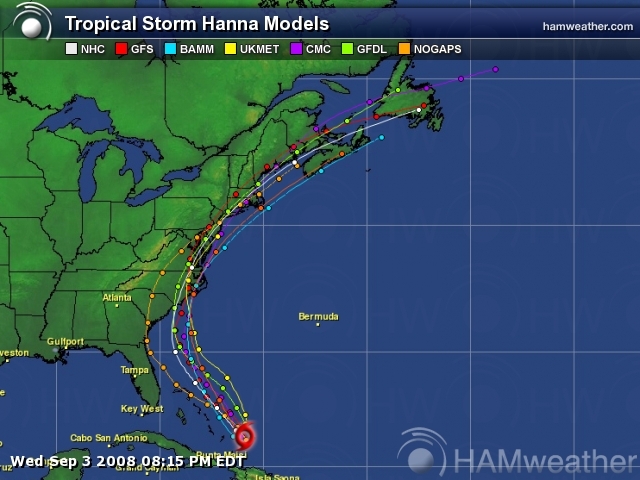 Hanna is finally giving an indication which way she will track. It does appear that the storm will stay east of South Florida and possibly make landfall in northern Florida, Georgia or South Carolina. 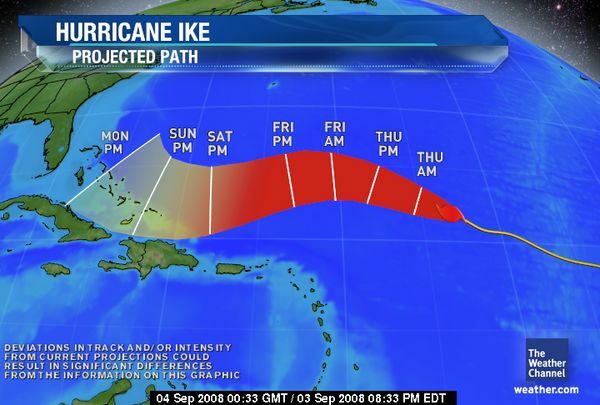 Hurricane Ike strengthened to a category 3. It’s way too early to determine what impact this storm will have on the US, if any. 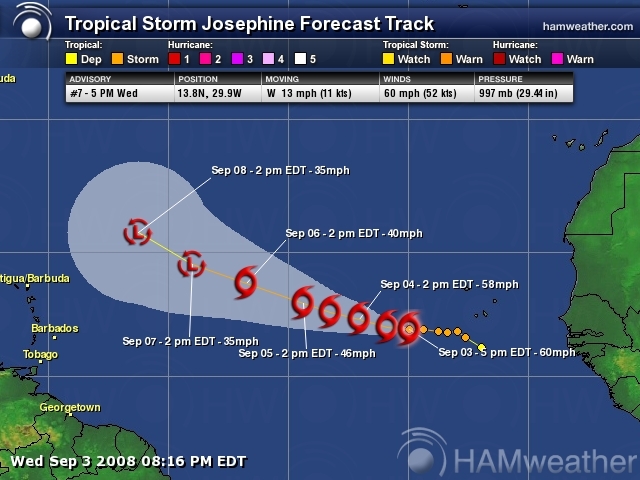 Tropical Storm Josephine is an interesting one. 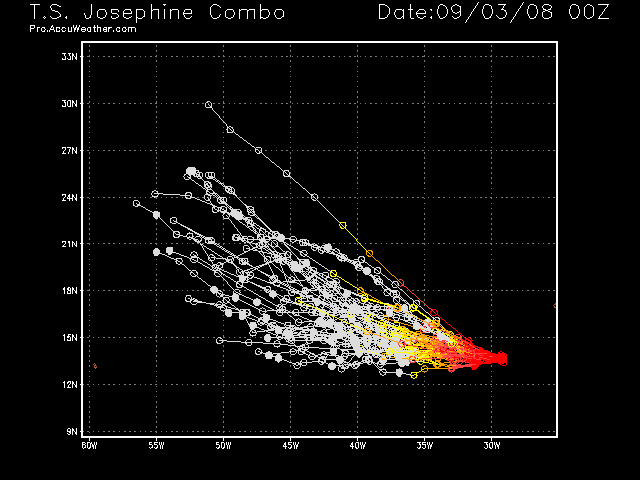 AccuWeather predicts that the storm will increase to hurricane strength while other models don’t see much of a future for Josephine, predicting that the storm will weaken to a tropical depression. 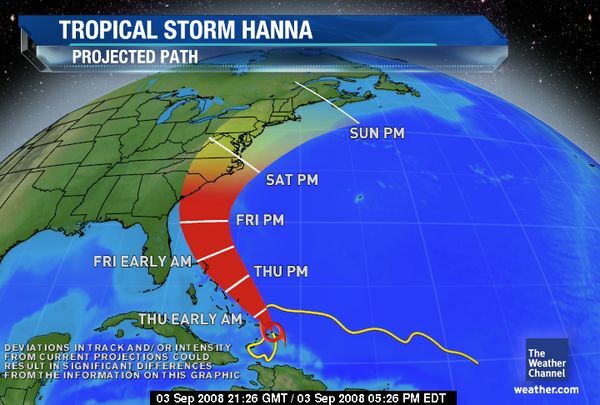 Florida Governor Charlie Crist has declared a state of emergency because of Hanna. Hanna was still a tropical storm, but maximum sustained winds have now increased to near 65 mph. Hanna is located near 22.6 north and 71.8 west or about 200 miles east-southeast of San Salvador in the Bahamas. Hanna is moving toward the north around 14 mph. The estimated central pressure of Hanna is 989 mb or 29.21 inches. Tropical storm-force winds extend outward up to 290 miles, mainly to the north of the center. 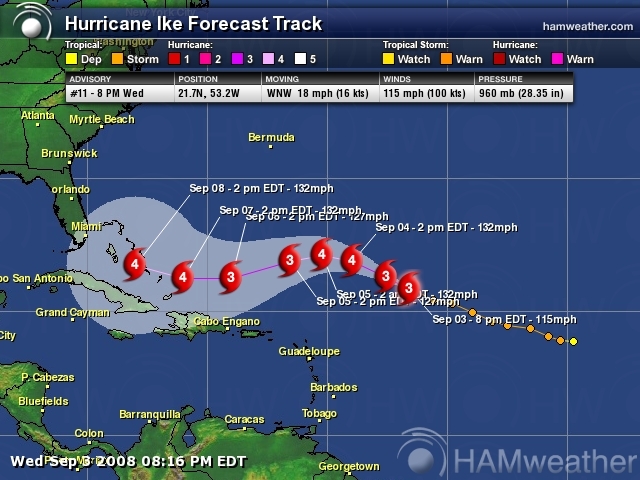 A hurricane warning is in effect for the central and northwestern Bahamas. A tropical storm warning is in effect for Hispaniola from Port Au Prince, Haiti, to Puerto Plata in the Dominican Republic. Interests in eastern Cuba, Puerto Rico, the northern Bahamas, the Florida Peninsula and all of the eastern United States should monitor the progress of Hanna. As the environment around Hanna becomes less hostile, intensification should occur with Hanna reaching hurricane strength, possibly by early Thursday morning. Hanna this evening has become better organized as she moves northward. Tropical storm-force winds will affect the Turks and Caicos islands, as well as the central and southeastern Bahamas. Rainfall from Hanna will also affect the central and southeastern Bahamas and the Turks and Caicos islands. Rainfall in these areas will average 8-12 inches with locally higher amounts possible through Wednesday. Storm surge caused by the winds around the storm will average 1-3 feet above normal water levels. Large, dangerous waves will batter areas where the winds are blowing onshore. Swells from Hanna will cause rough surf and rip currents along the Southeast Coast through Friday. While the exact future path of Hanna is somewhat uncertain, the storm began a northward motion Wednesday afternoon. 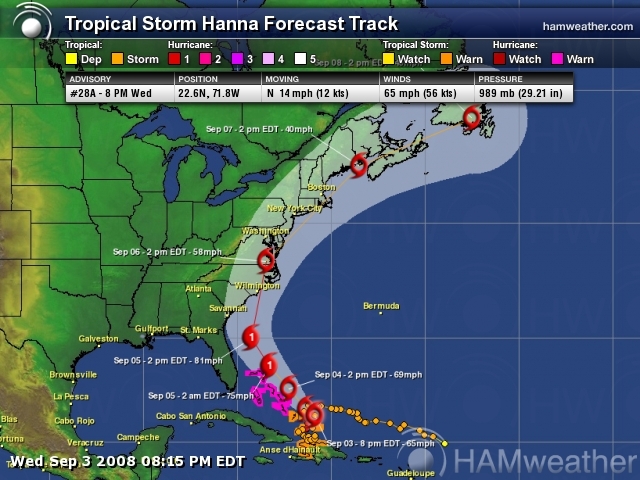 Hanna will move east of Florida and the Southeast starting on Thursday. Right now Hanna looks to pass fairly far offshore of Florida, but could still have a few stronger wind gusts near the coast along with some outer bands reaching the eastern coast. While the most likely area of landfall is early this weekend along the Carolina coast from Charleston on northeast, we continue to explore the possibility that Hanna will recurve more sharply and could possibly graze Cape Hatteras, N.C. on a path that would then continue to take the storm northeastward. 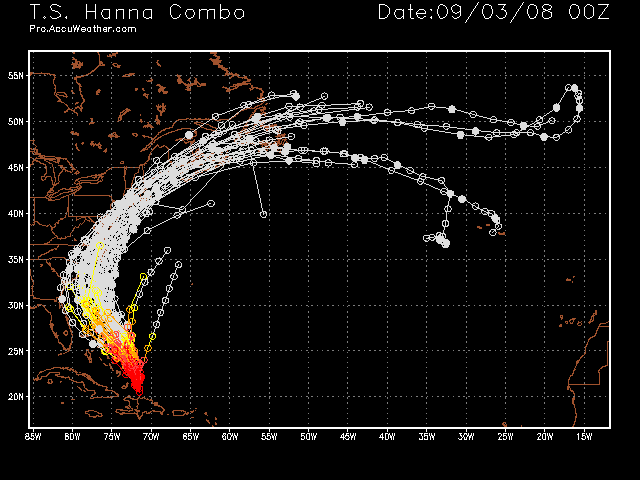 At any rate the strength of Hanna at time of landfall is expected to range from a Category 1 to Category 3 hurricane. A path paralleling the mid-Atlantic and New England coasts could result in hurricane-force winds well up along the I-95 corridor in the Northeast. A track farther inland over North Carolina would result in a swath of heavy rain, as well as strong winds spreading northward and inland from the landfall area. Ike has strengthened to a major hurricane as of 8:00 p.m. EDT and is near 21.7 north and 53.2 west, or about 645 miles east-northeast of the Leeward Islands. Maximum sustained winds have increased to 115 mph with higher gusts, bringing Ike to a Category 3 hurricane. The estimated central pressure is 960 mb, or 28.35 inches. Further strengthening is expected with this system over the next several days as a Category 4 storm possible as Ike heads westward. Ike is moving west-northwest at 18 mph, and a general west to west-northwest movement is expected to continue for the next couple of days. 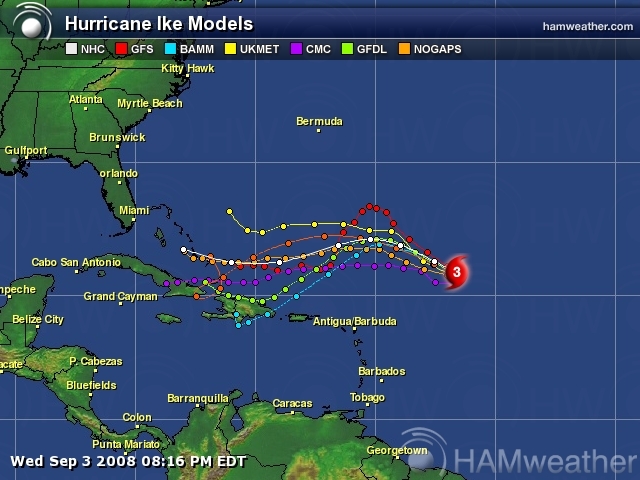 Computer forecast information keeps Ike away from land through Thursday. After that, the system is expected to pass close to or even over the Leeward Islands on Friday, then near or over the Virgin Islands and Puerto Rico on Saturday. 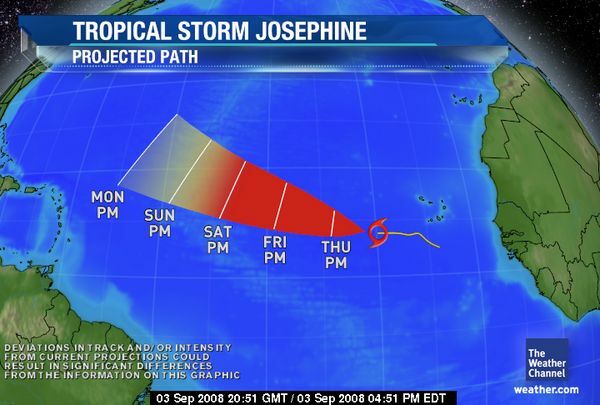 Tropical Storm Josephine continues to track westward in the far eastern Atlantic. 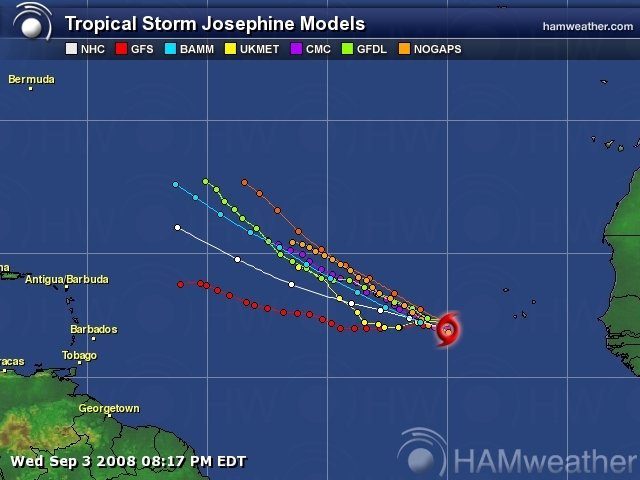 Josephine is moving to the west at 13 mph and as of 5 p.m. EDT was centered around 13.8 north and 29.9. Josephine will likely remain a tropical storm through Wednesday, but may strengthen further into a hurricane toward the end of this week. Winds are at 60 mph with higher gusts and the pressure is 29.44 inches. 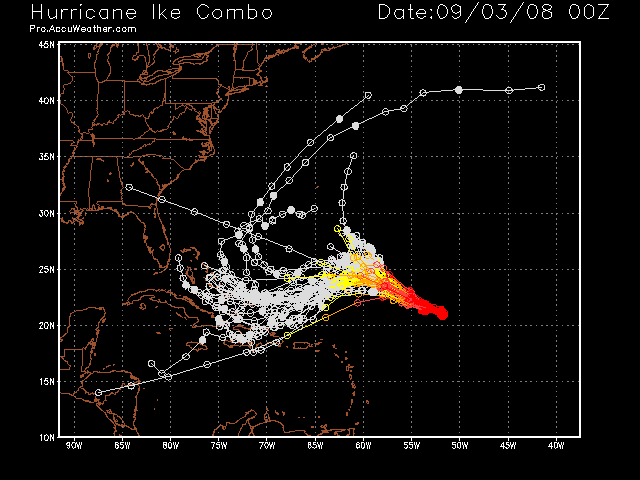 This entry was posted in Hurricane Season, My2bucks Eye On The Tropics, News, weather and tagged Hurricane Hanna, Hurricane Hanna computer models, Hurricane Hanna Spaghetti Models, Hurricane Ike, Hurricane Ike computer models, Hurricane Ike Spaghetti Models, Hurricane Josephine, Hurricane Josephine computer modesl, Hurricane Josephine Spaghetti Models, spaghetti models, Tropical Storm Hanna, Tropical Storm Hanna Spaghetti Model, Tropical Storm Ike, Tropical Storm Ike Spaghetti Models, Tropical Storm Josephine, Tropical Storm Josephine Spaghetti Model. Bookmark the permalink. Looks like Hanna will be dumping a lot of rain on Pennsylvania on Sunday. That will be a good day for indoor projects.